“What is the next new comic book movie?”, that seems to be the question every year. Warner Bros., Fox and Marvels Studios are pumping out comic book content every year in astronomical fashion. This November is DC’s turn at creating a team movie. Marvel and Fox have been working on them for years with their Avengers and X-Men franchises. With the Justice League movie showing this Fall, it is only appropriate to compile a list of a few Justice League stories. The cinematic Justice League will appear somewhat different. the group will miss long standing members such as Green Lantern and Martian Manhunter. Search for these stories to make you pine even more for this movie. Searching for the issues is half the fun of collecting comics. If you can’t find these single issues, the stories I am talking about are new enough to be collected regularly in trade format. For the uninitiated and for the long-time faithful, I provide you (in no particular order), a list of Justice League stories to prime you. JLA: Earth 2, a Grant Morrison and Frank Quitely joint. Not the first and not last, the 2 of them hit strides together, we saw them on Flex Mentallo, New X-Men, All-Star Superman, and Batman and Robin. These boys from Scotland took advantage of 96 pages and gave us an interesting graphic novel. The cast of characters are the Justice League of America (JLA), which in this form are Superman, Wonder Woman, Batman, Green Lantern (Kyle Rayner), Flash, Martian Manhunter and Aquaman and their Anti-Matter universe counterparts the Crime Syndicate of Amerika(CSA). Who are comprised of Ultraman, Superwoman, Owlman, Power Ring and Johnny Quick. In the Anti-Matter universe Alexander Luthor is the only hero and the CSA are his foes. The heroic Luthor makes a connection between his Earth and the one our heroes the Justice League live in, which is known as Earth 1. In doing so he captures his evil Earth 1 self and takes his place, his motive you ask? To seek the help of the Justice League to destroy the Crime Syndicate. After the breach between worlds has been made unexplained phenomena have started to occur. 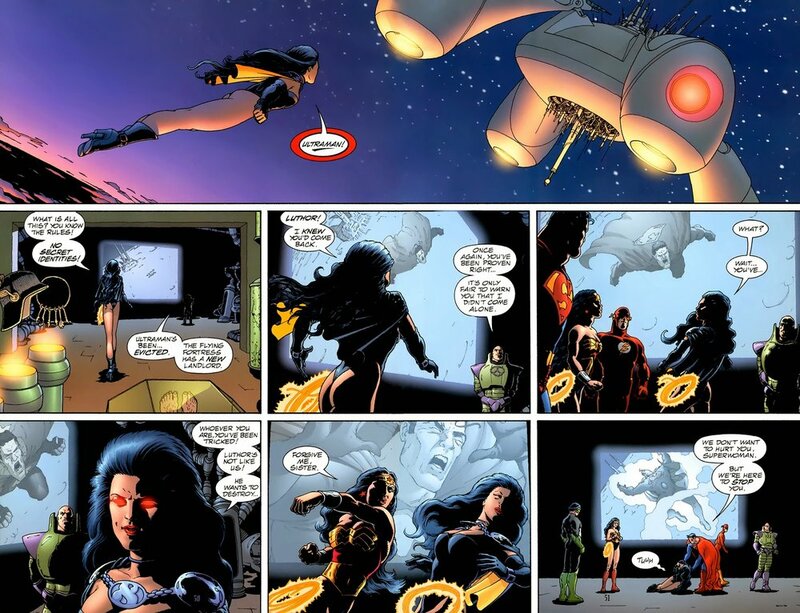 For one the JLA investigate a plane crash where the dead have their hearts on the right sides of their bodies. Almost as if these people crash landed from a parallel universe. After the discovery of Earth 1, the CSA decide there one goal is to exploit this universe. The JLA travel to the Anti-Matter universe to put things right while the CSA run rampant on Earth 1. These attempts by the Justice League are futile because chaos is the natural order of the Anti-Matter Earth. To not spoil too much in hopes that you read this story, now that the ground work is set here is a basic synopsis. The Justice League must fight the Crime Syndicate while putting 2 universes back together. It may seem like a lot and I know how convoluted Grant Morrison can be, but Frank Quitely’s artwork makes this book special. His drawings and visual storytelling is fun. This installment to the list is the most recent. It took place during the New 52. Two words will best describe this 10-issue story arc, Bat God. Batman sits on the mobius chair and is gifted the power of the god of knowledge. This story takes place 5 years after the defeat of Darkseid via pushing him through a boom tube. That first fight led to the creation of the New 52 Justice League. Lex Luthor has joined the Justice League because he feels a sense that a great evil is coming. He wasn’t wrong, the Anti-Monitor is ravaging through the universe destroying Earth 3 looking for remnants of it. Alas it has stumbled across another new member of the Justice League. Jessica Cruz is a new Green Lantern who wields the ring of the first Lantern Volthoom. This ring is from Earth 3; therefore, the Anti-Monitor must destroy it. Not only is the Anti-Monitor involved but Darkseid has a daughter named Grail, who will join the Monitor. Enter the New Gods and we have ourselves an epic of cosmic proportions. Battles are waged for the fate of the universe. With the direction the movie is going in, reading anything with the New Gods and Darkseid in it will be crucial for anyone’s reading list. After Grant Morrison’s run on JLA a writer by the name of Mark Waid took over. This next story was a favorite of mine even though it can seem outlandish. “Tower of Babel” describes in detail just how paranoid and/or untrusting Batman can be. The plot is based on Batman having contingency plans for all the other Justice League members. Because Batman isn’t super powered like his colleagues he needs a plan for everyone in case they go rogue. This contingency file outlines his counterpart’s weaknesses and ways to contain them. Ra’s Al Ghul gets his hands on this file and one by one takes out League members. The outlandish part of this story arc is when Al Ghul uses technology to wipe the written language from our minds. This story tests the trust of the Justice League and we see how the team reacts to Batman’s growing paranoia and weariness of the team. Howard Porter, who drew for Grant Morrison during his tenure stayed on this title to draw for Waid. An abundance of action was squeezed into these panels, although the story is only 4 issues it reads like 6 or 7 and flows well. Another tale written by Grant Morrison, although this was drawn by Howard Porter. “Rock of Ages” came about several years prior to Morrison’s Earth 2 graphic novel. Collected from 6 issues of JLA, this is a truly epic story. Yet another story of the Justice League pitted against a group of villains. Lex Luthor assembles an Injustice Gang. Assembled with himself, Joker, Mirror Master Doctor Light, Jemm, Ocean Master and Circe. Not only must the Justice League vanquish the Injustice Gang but Green Lantern, Aquaman and Flash are thrusted 15 years into the future where Darkseid has used the Anti-Life Equation to take control over New Genesis and Earth. To return the Earth to the way it should be the heroes must make a sacrifice in the present to assure victory 15 years into the future. Anything with Darkseid will prime you for what is in store for you at the cinema in several weeks. I want to finish this list with a story called “Justice League: A Midsummer’s Nightmare”. This trilogy of books written by Mark Waid and Fabian Nicieza as well as drawn by Jeff Johnson and Darick Robertson was a pivotal book. This book symbolized the ending of the many Justice League teams like Justice League International. Justice League International had a borage of line-up changes and the Justice League books in the 80’s into the early 90’s were stagnant. This story deconstructs the Leagues and creates one Justice League of America. We go back to a basic silver age line-up of members. We see Superman, Batman, Wonder Woman, the Flash, Green Lantern, Aqua Man and Martian Manhunter become the core of a new book. This would lead up to the long running JLA series with such scribes as Mark Waid, Geoff Johns, Grant Morrison and Kurt Busiek. As a prequel, this story has the citizens of the world accruing super powers while the Justice League (unbeknownst to themselves at this point) are not manifesting powers yet. These powers are being supplied by the team up of newly created villain Know Man and Dr. Destiny. Know Man manipulates Dr. Destiny to give the population powers so he can take their power. Upon receiving powers, the soon to be members of the Justice League foil the mystical plot of Dr. Destiny and Know Man. This prompts them to team-up to defeat the likes of which they had just faced. There is no way of delicately putting the twist without spoiling everything so I will put a pin in it.